OK friends, we are still moving our way through the kitchen and hopefully by now you are starting to feel in better control of this area. After all, let's face it, it is a place we spend an awful lot of time. By now you should have covered your Pantry as well as Kitchen Cabinets and Drawers. Don't lose your momentum quite yet, we are almost done! We have loved seeing all the pictures this week, and I love all the chatter and cheering each other on. Not only are we taking back our homes one week at a time, but we are building friendships! I love it!! 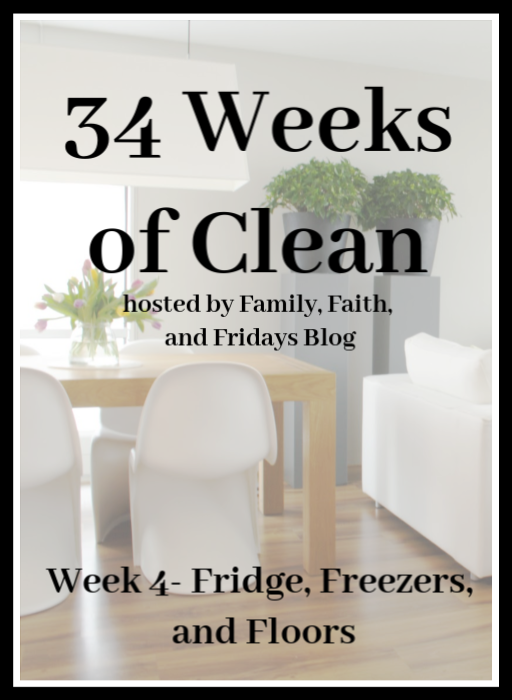 As we proceed with 34 Weeks of Clean, keep in mind our goals- deep clean all those surfaces, de-clutter what we don't need or simply do not use anymore, and re-organize. 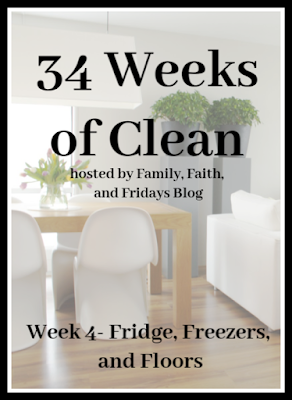 Last week was the first week where you had the chance to really start to de-clutter. Hey, I KNOW that the de-cluttering part is the hardest. I get it, really I do! But hear me out. Things that clutter our homes also clutter our hearts and heads. Life should not be about things. Things are nice, but people are better. Much better. Clear out what you don't need, you will not regret it. Have I mentioned I loathe getting down on my hands and knees to do floors, but yes, we are going to do it- together! Here we go! Start high and end low! In other words- fridge and freezer first, floors last. Here is why- open cans are your enemies, plus let's face it, not the safest practice! 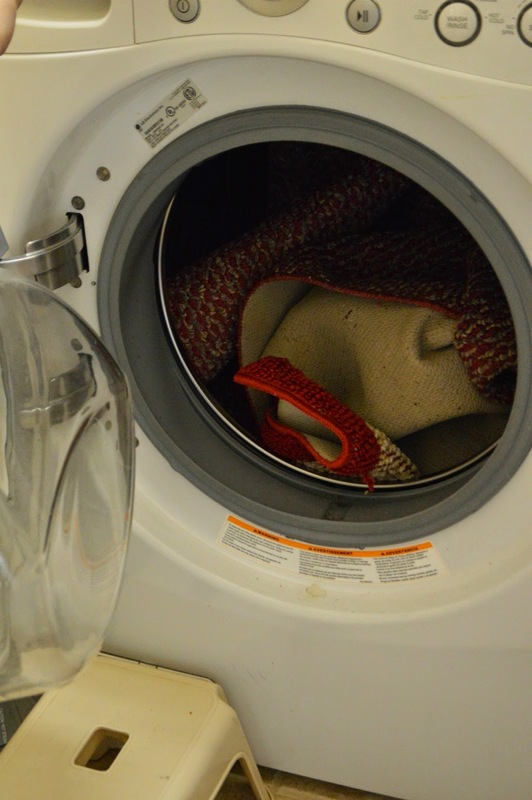 Take any bins, drawers, or dividers out and wash them with soapy water. Again, I use this homemade multi-cleaner, but do what makes you happy. Do every surface, inside and out, and do not forget the door handles and dusty top. Yes, even the top! I know, scary, right?! Please do not put open cans back in your fridge. Take the time to put the contents in sealed containers. Not only safer food storage, but cleaner! If you need to cover leftovers, we have found those cloth type coverings to work best. Ashton made the set I own, but I know you can buy them (try searching "reusable food cover" or "reusable bowl cover" on Etsy.com). When they get dirty I just pop them in the wash! I also started using mason jars a few years ago and they are great! They also pop into a lunchbox easily for quick reheat! Designate a space for things! We have a shelf for dairy, one for meats and leftovers, one for drinks, and at this stage in our life a shelf that is just for my adult daughter's groceries. I added a piece of parchment paper to the bottom of this drawer, we will see how it works. 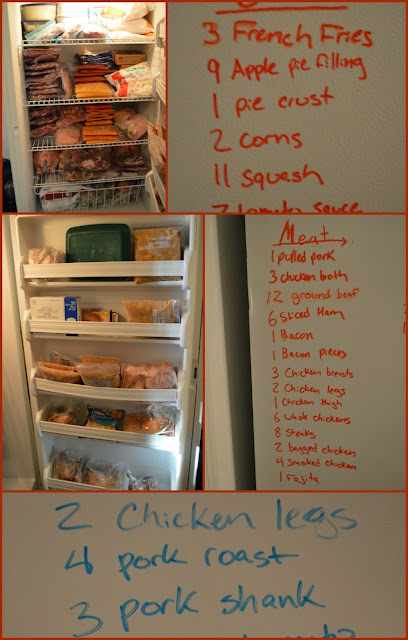 For those of you with large freezer and lot of frozen foods: make an inventory of your freezer space. This may not be an issue if you keep little frozen food on hand, but for us, I have seen it is a must. Usually I am a paper kind of gal, but after seeing our farm friends' method, I was sold! While I do not have this setup currently, I am still dreaming of the day when we can fill the extra freezer with a cow, pig and chickens. Well, the apple pie filling wouldn't be too bad either! Yep, dry-erase lists on the outside of the freezers! Admit it, for an outside freezer that no one else sees, it is a great idea! Can you tell I buy meat in bulk and freeze in portions? Last thing for the week- take this time to wipe down the trash cans on the outside and clean the inside. Next week is a smaller assignment and one I really enjoy - see 'ya back soon!